Born in Trinidad with Biliary Atresia, a rare liver disease, Hannah Bhagwandeen has been through more than most two and a half year olds. By the time Hannah was 18 months old she had received two liver transplants, one from her father and a second from an anonymous donor, and had been diagnosed with profound hearing loss in both ears due to the effects of her treatment drugs. Initially, Hannah’s mother, Thalia, blamed her daughter’s speech delay on the fact that she had been through so much during the treatment of her liver condition. She thought her daughter was a typical toddler ignoring her commands as a way to assert herself. She soon suspected something more serious when she heard her daughter crying in the other room. She tried to reassure her that she was coming but when she approached her daughter from behind it made the little girl jump. Thalia knew then that her daughter had not heard her comforting words at all. Doctors confirmed that Hannah had suffered permanent and profound hearing loss. The diagnosis was devastating to Hannah’s parents. Trinidad could offer no treatment to reverse the condition which meant Hannah would live her lifetime with the hearing loss. Going abroad for treatment wasn’t an option as they had already exhausted all their financial resources treating Hannah’s Biliary Atresia. When they heard of Herbie Fund available through the Hospital for Sick Children (SickKids) they immediately applied. After being assessed at SickKids, it was determined that Hannah was a good candidate to receive cochlear implant in her left ear and surgery was scheduled. Thalia was filled with hope upon meeting the audiologist at SickKids who also wears a cochlear implant and grateful to be able to discuss the treatment with someone who had been through it themselves. 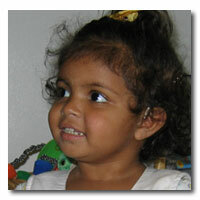 In June 2010, Hannah had the hearing device implanted. In July, it will be activated. Thalia cannot wait to hear her daughter speak for the first time and say all the things typical toddlers do; “Mommy”, “Daddy” and “no”. Hannah, who loves to colour and play soccer, will continue to receive treatment at SickKids until October when they will return home to be reunited with family and friends in Trinidad.